Falcon Age is a game about the relationship between human girl Ara and her bird, or at least that’s the part that really matters. The humans of Ara’s world have been subjugated by robotic colonizers from another planet, slowly taking over the beautiful desert world with smoke-spewing industrial plants. Ara aims to shut down the mechanized refineries and reclaim the land. With her best bird by her side, she battles robots and flips switches, shutting down the industrial complex in the name of her people. There’s not a lot to Falcon Age’s story. There are three refineries to shut down, which doesn’t take long. There’s a dramatic rescue that winds up being unnecessary, and then, after the players perform a final action I will not spoil, the game ends. From start to finish my first playthrough of Falcon Age lasted around three hours. There are a couple of side missions Ara picks up from other characters, and there’s a conflict between Ara’s resistance-minded aunt and her corporation-loving mom that doesn’t end up going anywhere. I would have liked to get to know the world better. But that’s okay, because I got to know Ara’s bird companion. I chose to name her Damini, and she’s my bird of prey. My alien raptor. No relation to former Kotaku managing editor Tina Amini, but secretly her bird-sister. Damini is the most endearing creature I’ve come across on my PlayStation 4. Developer Outerloop Games, inspired in part by golden eagle hunting videos, created a delightful animal companion both on the television screen and in virtual reality. Forget the robots. Forget the resistance. Forget Ara’s mom and her insistence on showing her daughter pictures of dogs, cats and other pets she could own if she just fell in line. Falcon Age is about whistling for your bird and having her light upon your outstretched arm. It’s about ruffling her feathers with your fingers. It’s about collecting toys as rewards from other characters that make the bird sketch pictures or skateboard. It’s about dressing her up in dog hats. Everything Ara, and by extension the player, does with Damini, or whatever she’s named, is joy. Siccing her on colorful alien goat creatures and watching her lift them up and slam them to the ground? Joy. Sending her after wild peppers growing on cliffsides, then having her on your hand with the vegetable in her little paw? Awesome. Arming her with digging claws and using her to clear land mines? That part’s kind of tedious actually, especially since the landmines respawn for some reason, but it’s not completely bereft of joy. 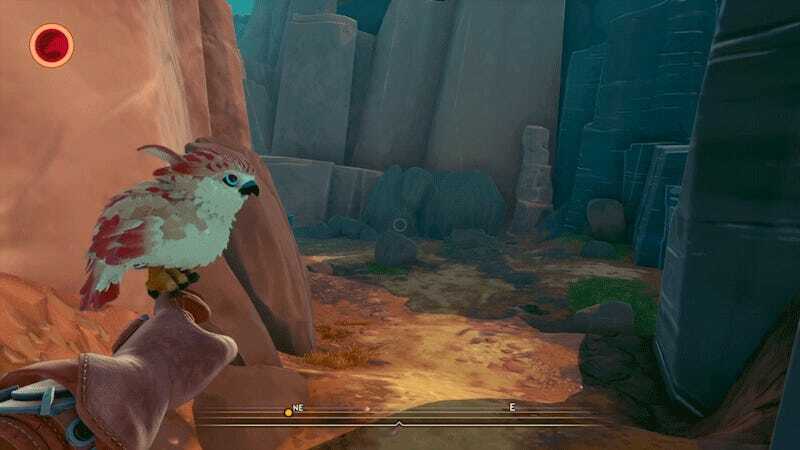 Either way it’s played, the bird bits of Falcon Age are delightful and charming. Story and combat feel half-baked, and we don’t learn much about the beautiful world the game takes place on. The whole affairs feels more like a showcase for awesome virtual bird technology than a fully-realized game, but it’s a super-endearing showcase. The birb is love.